When the earthquake struck on September 28, 2018, Indonesia’s Sulawesi island flowed like water. Currents of mud swallowed anything in their paths, sweeping away entire sections of the city of Palu and crosscutting the region’s neat patchwork of crop fields. Minutes after the shaking began, locals were caught unaware by a wall of water that crashed onshore with devastating results. As the sun set that evening, thousands were missing. Within days, the smell of corpses permeated the air. The 7.5-magnitude event was 2018’s deadliest quake, killing more than 2,000 people. In the efforts to understand how this fatal series of events clicked into place, much attention has focused on the surprise tsunami. But a pair of new studies, published February 4 in Nature Geoscience, tackles another remarkable aspect: The earthquake itself was likely an unusual and incredibly fast breed of temblor known as supershear. The Palu quake cracked through the earth at nearly 9,200 miles an hour—fast enough to get from LA to New York City in a mere 16 minutes. Such a fast rupture causes earthquake waves to pile up in what’s known as a Mach front, similar to the pressure wave from a plane traveling at supersonic speed. This concentrated cone of waves can amplify the quake’s destructive power. “It’s like a sonic boom in an earthquake,” says Wendy Bohon, an earthquake geologist at the Incorporated Research Institutions for Seismology (IRIS). 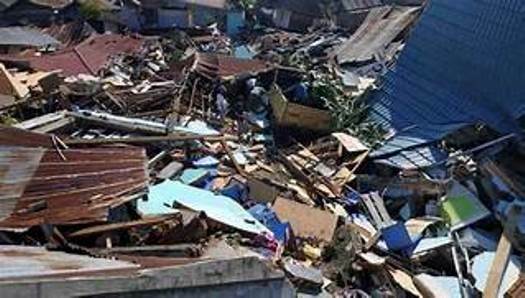 While it’s not yet possible to say for sure if the supershear speed intensified the Indonesia quake’s landslides, liquefaction, or tsunami, the pair of new studies does offer a rare look at this little-understood and potentially deadly phenomenon. “We have observed only a handful of supershear earthquakes, and even fewer with this level of detail,” says seismologist Jean-Paul Ampuero of the Université Côte d’Azur in France, a coauthor of one of the studies. During an earthquake, the entire length of a fracture doesn’t break all at once. Rather, it unzips the planet’s surface at a rate known as the rupture speed. Stephen Hicks, a seismologist at the University of Southampton, explains the phenomenon by grabbing a colorful flier sitting on a table at the American Geophysical Union Fall Meeting in Washington, D.C. He makes a tiny tear on one side, and says: “Imagine that’s your nucleation,” or the start of a rupture on a fault. The rupture speed is how fast that point moves through time, he says, and with a sharp jerk, he rips the flier in two. It’s this speed that caught geologists’ attention with the Indonesia event. To take a closer look, Ampuero and his colleagues harnessed the power of the growing global network of seismic stations, which detect the echoes of earthquakes from hundreds of miles away. From that network, they collected data from 51 locations across Australia. By studying the arrival of earthquake waves at each station, the team recreated the racing rupture. It’s similar to how your brain figures out where a sound is coming from, Ampuero explains. If someone is talking to you from the right, the noise arrives at your right ear a fraction of a second before your left. Your brain then uses that delay to locate the speaker. This revealed that the temblor broke so fast that the rupture speed overtook a type of radiating waves known as shear waves, thus the term “supershear.” Over roughly 36 seconds, the quake cracked southward through some 93 miles of Earth’s surface. “That is the ground breaking that fast, which is pretty amazing,” marvels Hicks, who wasn’t involved in the research. A second team took a closer look at changes to the surface after the temblor ripped through, using data and imaging from satellites before and after the event. “We were immediately struck by the sharpness of the rupture at the surface south of the city of Palu and by the great amount of displacement in this area,” study coauthor Anne Socquet, of the Université Grenoble Alpes in France, writes in an email. This analysis suggests that the land largely shifted horizontally, and that the change was massive: The ground offset by 16.4 feet at its maximum point south of Palu City. The shift was so large, it was easily seen in images of the region post-quake. Roads were offset; buildings seemingly cut in two. “This is definitely huge for a [magnitude] 7.5 earthquake,” Socquet says. “And this is likely enhanced by the fact that this earthquake was supershear.” It didn’t happen just at the surface, either, but also as deep as roughly three miles underground. In the southern stretches of the fault, an important feature behind this rapid speed and the deep shift is what Socquet calls its “maturity.” Tectonics have tested this break time and time again, continually shoving the blocks of Earth side by side and carving the fault into a fairly continuous, smooth, straight break—features previously associated with other examples of super-fast ruptures. Yet even within this category of rare events, the Palu quake may stand apart. Most supershear earthquakes actually travel even faster than the one in Palu, cruising along almost as fast as another type of earthquake wave known as a pressure wave. These commonly zoom by around 11,200 miles an hour. But Ampuero and his colleagues found that while the Indonesia quake was fast enough to be supershear, it didn’t hit this top speed. “It’s extremely rare to see events in this intermediate range,” he says. Ampuero and his colleagues believe the discrepancy is due to the fact that earthquake models, including the one used in this work, commonly assume that the rocks surrounding a fault are one intact unit. But that’s not always the case in the real world, where zones of fractures around the break can slow the speeds of a quake’s associated waves through the surface. If true for Sulawesi, this would mean the quake’s pressure waves could have moved about as fast as its rupture speed, as is expected for supershear ruptures. The quake was still weirdly slow for supershear, but at least its waves and rupture would have moved at the right relative speeds. However, the scientists won’t know for sure that this was the case without more study in the region. That’s not the only thing unusual about the event. September’s earthquake also seemed largely undeterred by two major bends in the fault. Zigs and zags along the rupturing fault usually slow earthquakes, like cars on a winding road, but not this one. And unlike most supershear breaks, which need a little warmup, the Palu temblor seemed to hit its galloping pace early on. This behavior raises even more questions. Could the fault be straighter at depth? This would have helped it barrel through bends higher up, Ampuero notes. Did smaller foreshocks supercharge the big quake? This could have sent it galloping out of the gates. But this early speed could also have to do with the roughness of the fault, which could stick the sides together like the rough sides of sandpaper and cause the ground to break with extra oomph. These unusual features make this earthquake all the more valuable, since they can help researchers better understand both where and how super-fast quakes can happen. The scientists who reviewed the work all stressed the significance of this information for future modeling and hazard assessments not just in Indonesia, but around the globe. “What happened here could likely happen on other faults, especially major plate-boundary faults,” says Eric Dunham, a geophysicist at Stanford University.